It looks better in the flesh than in the pictures. On paper the CCM can appears a little awkward and lacks any real bite, especially from the front. But first hand it has a real presence. It’s bigger and stockier than I thought, and in the black carbon wrap of this late-stage prototype it has a certain presence about it. Sadly white will be the only colour available when the bike goes on sale in October/November. That might be necessary to get the bike on sale for then, but I think after that CCM seriously needs to look at issuing it in black, because it’s the colour I’d choose and just works well with the overall shape of the bike. Being a late-stage prototype none of the panels are the finished article. They have been printed up on a 3D plastic printer, so not as robust as the final assembly. Italian-based Acerbis will make all the final production plastics; this prototype is currently sporting a front mudguard borrowed from a KTM, so expect a slight re-design of that. Quality of the frame, the swingarm, the headstock and the switchgear feels good and solid. 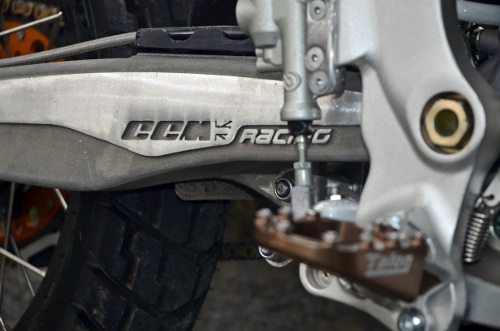 I like the small touches, such as the Union Jack of the logo, the CCM imprint in the swingarm, the Talon footpegs, the integration of the optional (£1,200) Tractive suspension control in the tank cowl. It’s neat and well thought through. Out on the test route the bike drew a lot of attention, even among the non-biking community. A bone of contention this one. Some say it should have been bigger. Some say it should have six gears. But it isn’t and it hasn’t. Instead it’s a 450cc BMW engine from the now-discontinued G450X, built by Kymco in Taiwan, with the standard fit five-speed box. A long-ratio, or six-speed box will be offered, but not as standard, as that would mean re-homologation. Instead, you can take your bike back to the factory and have the gears retro-fitted (this gets around the need to re-homologate). Not ideal, but perhaps the only real world compromise for a small company on a budget. Personally, for these types of roads, I didn’t think it needed another gear. First gear is long and perfect for the rocky trails, only needing to change up when the trail opens out. A change to the gearbox and ratios could ruin this, which would be a shame as the CCM seems, as much as anything, the ideal bike for the average green-lane novice to build their confidence on. I do have reservations about this engine for long round-the-world distances. I question whether it’s smooth or refined enough for long distances (there’s a bit of buzz through the pegs and bars), though some of that apprehension could stem from engine mapping that still needs fine tuning ahead of the final launch. This will be done in Germany by former employees of BMW. Austin Clews, head of CCM, talked of a possible 650cc in the pipeline, but was keen to stress such a development is a long way off and for now the 450cc is where the company’s attention lies. In truth, on a day like today, in this environment, the bike didn’t need a bigger engine. Or more gears. Service intervals are every 5,000 miles, essentially just oil and filter change, which you could do out on the road yourself if needs be. Valve clearance would also need checking, but that’s not a difficult skill to learn. The rest is just a check of bolts, pads, brake lines, that sort of thing. In its original guise as a race engine, there was talk of it needing a strip-down every 70 hours of riding, improbable for an adventure bike. To overcome this, maximum revs have been dropped from 8500rpm to 7000rpm. 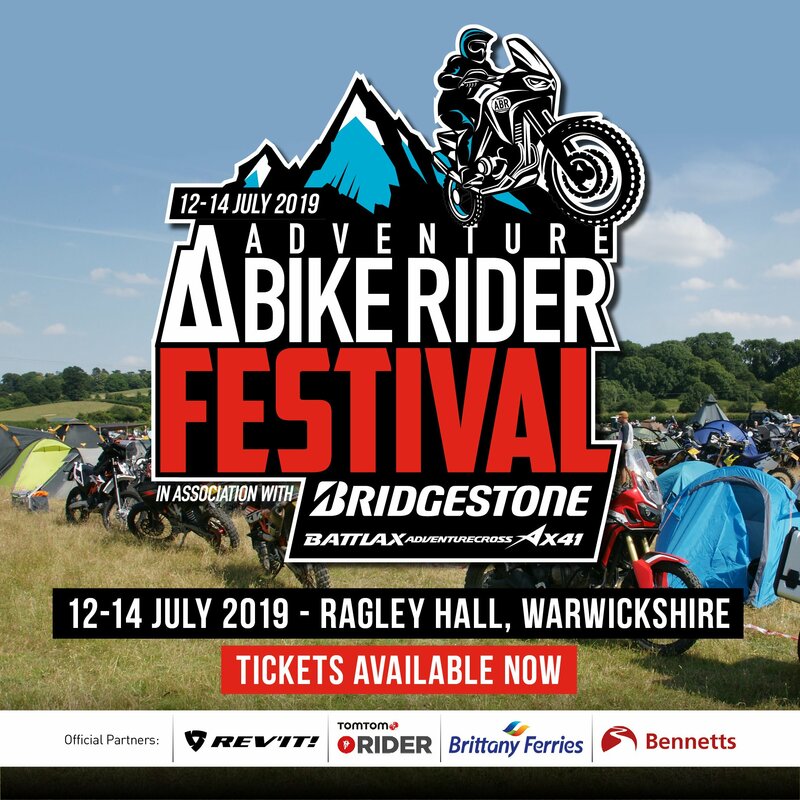 A full strip down is suggested to take place now every 15,000 miles, but as with all things, it depends on how you ride it, and as you generally ride long distance bikes with mechanical sympathy in mind there’s every chance that a well looked after bike shouldn’t need this. 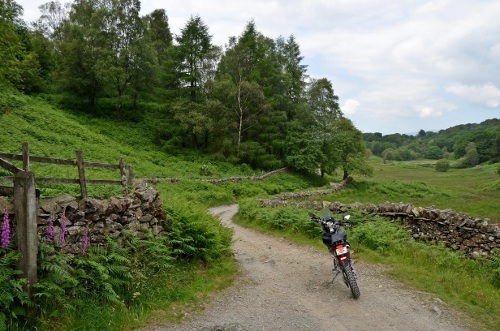 Reports on forums are of a similarly engined bike now over 35,000 miles and still without strip-down. The bike comes with 41hp as standard, though for a price not yet confirmed (thought to be around £50) you can buy the full power plug in, releasing the full 51hp by restoring maximum revs to 8500rpm. Sadly, doing this null and voids the one-year factory warranty (something the factory can check when they plug in to the ECU). Personally, if I was buying one, I’d be tempted to give it a shot at full strength, as running a bike half throttled is bound to leave you inquisitive after a while. It’s interesting to note that should things go wrong, CCM is prepared to supply you with a brand-new crated engine, anywhere in the world. That might sound extreme, but many large capacity bikes have been stricken before now by simple mechanical problems, with the cost of repatriating the bike far more than having a new engine shipped out to you. Price of a replacement CCM unit from the factory is yet to be confirmed but rumoured to be around £1,500. The bike runs fully-synthetic 10W/40, with no increase in the oil reserve. This has been another big bone of contention on forums, with some saying it should have more capacity. CCM’s answer, having spoken to the original engine designers about it, is that an increase in oil reservoir would alter the temperature at which it runs at, which would be detrimental to the engine, hence why they stuck with the original one-litre capacity. Sceptics might say it’s to avoid redesign costs, but only in the real world will we ever really know if it’s enough or not. All in all the engine is not the bike’s weakest point (as some thought it might be), and in a way defines what the bike is all about; lightweight, with a lot of flexibility, power delivery that doesn’t intimidate, and crucially for this sector, serviceability out in the field. The seat design is still to be finalised. Austin aims to make it a touch flatter, with a crest behind your bottom to rest against. Personally I think the bike needs this. 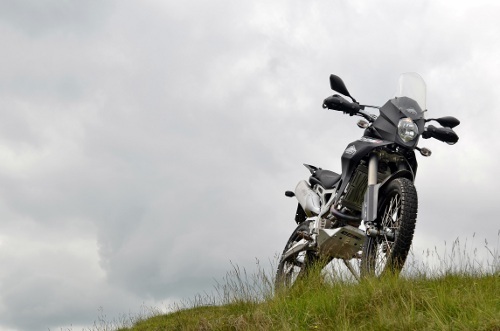 As it is, the seat keeps you a little further forward than you’d ideally like to be on a long-distance ride, though perfect on a single day’s ride such as this one, suggesting just how difficult it is to build an ‘adventure bike’ without having to compromise somewhere. Reach to the handlebars is good, and with the active suspension a few settings up from softest (nine settings in total) I was able to get both feet comfortably on the ground. Firm it up and I struggled a little when manoeuvring the bike around on tip-toes. 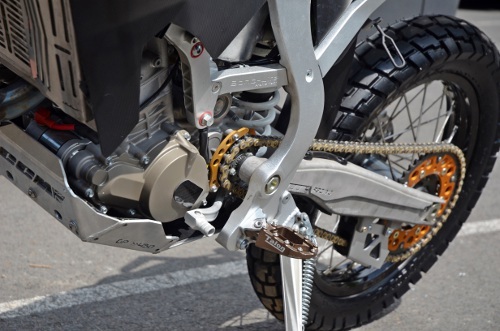 I stand at 5′ 9”, suggesting riders a few inches beneath that might want to order their bikes with the factory fit lowering kit, which uses a different rear shock to reduce ride height (and ground clearance) by 100mm. The front fly screen, while relatively small, does a decent job of keeping the wind blast off. It was hard to tell at what speeds it was effective as the speedo was yet to be calibrated, but I’d say at around 60mph you’d be quite comfortable (top speed circa 90mph). There is a certain amount of vibe through the bars and pegs (an intrusive amount at first), but you do get used to it. Even with the Tractive suspension (a £1,200 option) set to its softest setting the bike still felt taught and controlled on the roads. The roads we were riding on were tight, narrow, sometimes open and flowing through the valley. The wheel would lift over the crests, and at all times it felt stable and planted. It gave me confidence to push on harder than I might, and I think that’s where a bike like this; light in weight at only 130kg, with that eager engine, really comes in to its own. 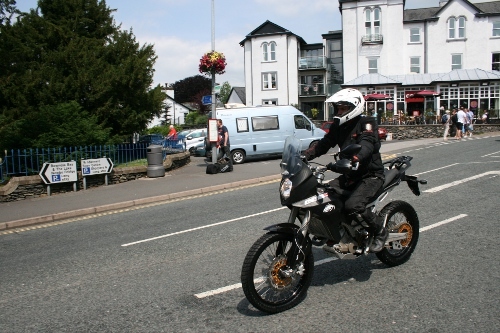 In terms of off-road capability, enduro expert Llewelyn Pavey has been quoted as saying he’d like stiffer suspension. Myself, an enduro novice, wouldn’t ask for the same. If anything I was surprised how firm the front was. Not too firm. Just firm. Up on the pegs, low down in first gear, again the bike feels agile and easy to thread along the rocky, steep gradient trials of the test run. At times I had to dab my feet, once through a rocky ford, the bike starting to topple, but in weighing so little it was easy to catch, which was reassuring. I opted to stick with the road-legal Dunlop Trailmax tyres, rather than switch to the optional – knobblier – Dunlop Geomax. For me the Trailmax provided more than adequate grip on the trails. The only slight niggle was the back brake; the lever just not having enough travel (or pad area), making it difficult to minimise the back wheel from on the loose downhill sections. Other than that I was surprised how easy the bike was to ride off-road. I’ve said about the seat, and how perhaps it could do with being a little flatter, less forward pushing. Otherwise comfort is good. In terms of fuel range, the GP450 Adventure has three tanks, all feeding in to the same line. There are two 3.5-litres either side of the frame at the front, plus an 11-litre tank beneath the seat. The filler for all three is at the back end of the seat, slightly inconvenient if you have a load strapped on the back. The team reckon on a 250 mile range from the combined 18-litres. That would mean a 62mpg average, which I wonder might be a touch ambitious. Perhaps 200 miles would be realistic, which is still pretty decent and ample for almost all overland adventures. Hard luggage will be available; though likely more pleasing on the eye will be the optional soft luggage the team is hard at work on. It will be waterproof and frame-fitted for security. No official word on cost. 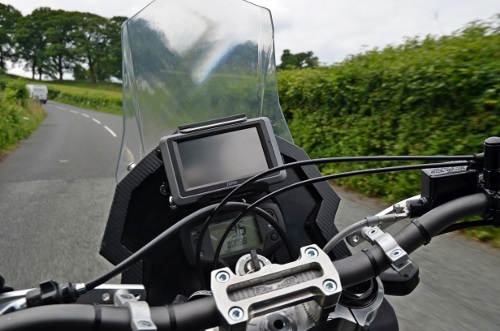 An integrated GPS system will be available, with the team also talking about an integrated dash camera at the front, which I think is a great feature, and far handier than having the helmet cam strapped to your head. An auxiliary power socket will also be available; it will be mounted in among the instrument cluster. Work is also in progress to offer an optional decoy exhaust pipe on the left hand side; somewhere to store tools or integrated water and oil carriers; a superb idea from a long-distance riders’ point of view. In terms of two-up adventuring I think that’s a step too far for the CCM, and in a way would ruin the appeal of the bike in the first place. The question remains over the suitability of the engine for the epic big trip. It would certainly force you to alter your approach, and perhaps your route. Long straight roads wouldn’t be much fun, nor would big distances just to get somewhere. But I think here we have to make the distinction between ‘adventure’ and touring. This isn’t a touring bike. This isn’t an alternative to a GS. And in reality, the adventure for many of us is a weekend away, or a long day’s riding to escape life for a little while. 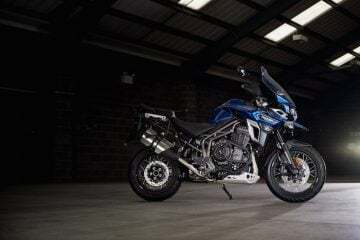 With the extra fuel load and the comfier seat I think what we’re looking at is the ideal short-term adventure bike, with the possibility of going around the world if you really wanted to. At the end of the day, there is no perfect ‘adventure bike’; all have to compromise somewhere, whether it be on weight, reliability, performance, comfort, or in this case, motorway appeal. I spent five hours or so in the saddle of the CCM, mainly on narrow side roads and winding B-roads. I liked the bike. I felt there was a lot of charm to it. I wanted to ride it more and I wanted to go in search of the type of roads that it seemed to excel at. As I said, I don’t think this is necessarily a great round-the-world bike (but then what is); what I do think is that it’s a great long-distance green-lane and dual sport bike. If you had a weekend or even a day then with the extra fuel on board you could really get a good day’s riding out of it. That said, if someone gave me one of these to take off on then I’d put it on a cargo boat to Buenos Aries and ride it up through South America as I think it’d be perfect in that environment. I certainly wouldn’t worry about the reliability of the bike or the engine. The bits that are bought off the shelf are good bits, and the bits that CCM has made are good bits too. There doesn’t seem any real weakness to what is essentially a very basic motorcycle. Wheels, engine, electronics, good suspension, well thought through design, nothing else needed. All this brings in to question the issue of cost. Is £8,000 too much for this bike? Would a KTM or an old DZR 400 be better value? Perhaps they would. I think where this CCM justifies the premium price tag is that it feels unique, it feels like you’re riding something bespoke and different. It’s more than the sum of its parts. And I think, as irrational as it is, that having the Union Jack on the tank does add a certain value to the package. It’s uplifting to think that a team of 11 in a factory in Bolton (building one bike each per day) is daring to do something a little different and take on the big boys at their own game, and in a way, show them how to do it. Would I buy one? Yes. Would I ride it around the world? Maybe. Would I wake up every Sunday and want to take it for a blast? Definitely. It’s a great bike and I wish CCM well. Plans are to sell 400 units a year, with availability initially in Europe, followed by plans for North America and Australia. 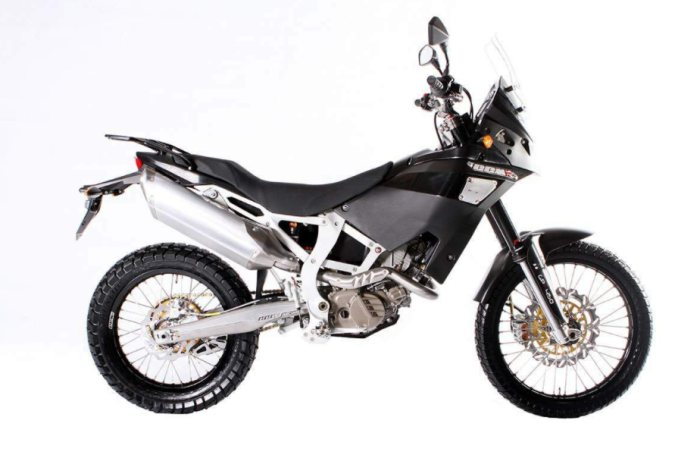 For more information about the CCM GP 450 Adventure, click here.